Starting to keep bees is an adventure, but, however long you have been a beekeeper, the beginning of each season is a new start, because every season and every colony of bees is different. If beekeeping is something you are trying for the first time there are good ways, and bad ways, of going about it. It is essential to grasp the notion that honey bees are totally different to any other type of livestock: They are always wild, they can fly where they want to and cannot be confined, they certainly cannot be stroked and they will never recognise you. On the plus side they do not need feeding every day or shutting up at night and you can go away on holiday for a week and they will come to no harm. Beekeeping is a fascinating adventure into a new world. But how do you start? The first step should be to contact your local beekeeping Association. Here in Warwickshire we have 8 Branches, which cover the whole County, so you will not have far to travel. Go along to meetings, handle some bees to see if you like the idea and, if possible, attend a course for beginners. Then, in May or early June, you will be ready for your own bees. Do not be tempted to get bees earlier than this and never, never, purchase bees in the late Summer, Autumn or Winter. Bees can be obtained in a number of ways, depending on the size of your pocket, and availability: You could purchase a brand new hive and wait for a swarm to put in it. Associations usually have a system for collection of swarms and a list of people who want them. Or you could buy a nucleus of bees to put in your new hive. This is about 1/2 a hiveful of bees on 5 frames usually, with a marked queen, and is the best, but most expensive, way to start. The nucleus will grow as your confidence grows and should not be too taxing in your first season. 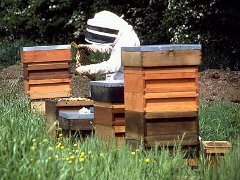 Second-hand hives are usually available, and again the Association is a good source. The hive may be empty or may come complete with bees. This can be a very good and cheap way to start but a full-sized colony can be somewhat daunting for a new beekeeper. A word of caution – bees are subject to a number of diseases, some of which are very serious and persistent, so any empty wooden hive parts should be flamed with a blowtorch (to a light coffee colour, not to charcoal), even if they have been out-of-use for many years. Second-hand frames should never be used, unless, of course, they are part of a complete hive + bees or in a nucleus. Equipment is available from the beekeeping suppliers or from their agents, who can be found in most areas. To come back to my opening remarks, every colony of bees, and every season, is different, and even experienced beekeepers are always learning. The thrill that you feel when you open your first hive, for the first time, is something that should stay with you all your beekeeping life. No-one keeps bees to get rich but they give hours of pleasure, are always fascinating, open up new worlds of botany, photography, art, carpentry and many more, as the fancy takes you. 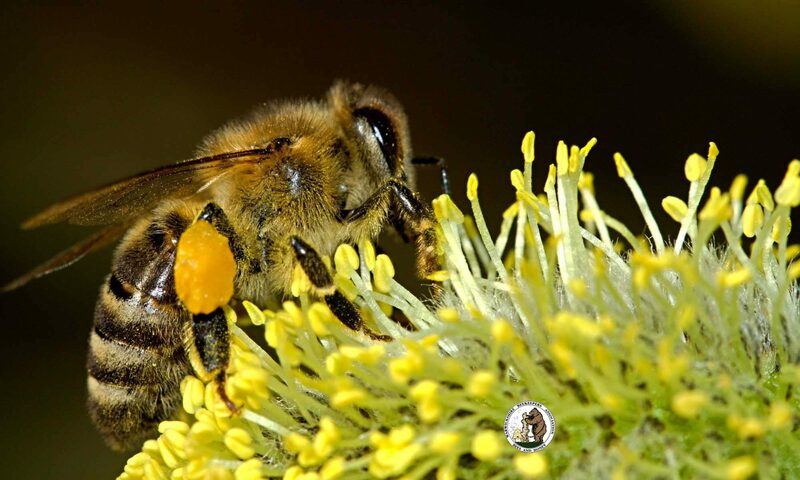 Aside from personal benefits, the environment and the crops around you will be improved as the bees pollinate the many flowers they visit in search of nectar and pollen. This is their real importance in the world and, in addition, they will provide you with the best honey you will ever taste. Looking at a hive or, more specifically, a colony of bees, takes practice. The Branch apiaries are run by dedicated experienced beekeepers for the benefit of less experienced beekeepers, potential beekeepers and anyone interested in finding out more about bees and beekeeping. Inexperienced beekeepers go along to observe, practice handling bees and ask questions from an expert. Anyone can join in! Simply let the branch know you are interested in joining a meeting or if you just turn up, come with some suitable gear. Beekeepers are as gentle as possible when handling their bees. However, there are times when everything is not sweetness and light, and somebody gets stung. Some beekeepers manage to work with very little protection but most of us admit to feeling more confident encased in bee suits, boots and gloves. The traditional bee suit is an all-in-one affair elasticated at the wrists and ankles. Front openings and pockets have zips rather than press studs, leaving no little gaps for bees to crawl through. Most branch apiaries have one or two spare suits for visitors or, if not, at least a veil. Phone the branch secretary prior to your visit to arrange to borrow one. However, if there is a group of you, come with garments which afford protection. Avoid woolly clothes. The type of anorak (not fleece) which has a zip front and elasticated wrists and bottom will do. It can be worn over loose trousers with the bottoms tucked securely into socks. Also, bring a pair of wellies and some gloves. Almost any gloves will do provided they are not woolly. Traditionally, beekeepers wear soft leather gloves but Bee Inspectors now encourage wearing good fitting kitchen gloves. They come with long cuffs that extend up the arms and are not very expensive. You may notice some beekeepers wear surgical gloves over their other gloves. This is not done to protect the beekeeper but to protect the bees from diseases which can be transmitted from one hive to the next by the beekeeper. You will still need to borrow a veil. You are welcome to visit any branch. We look forward to seeing you!